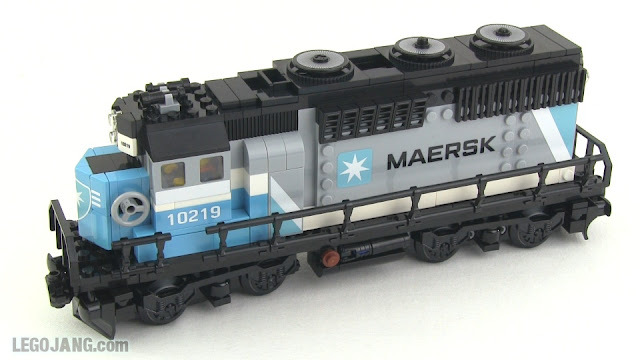 I really did plan on keeping my Maersk train intact and non-customized, I swear! It looked perfect to me in every way when built to official LEGO specs. 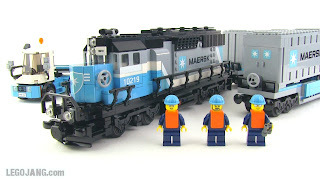 However, when I set it down on a siding in my digital layout in BlueBrick, things did not look right at all. The locomotive was just too, too long for the small spaces in which I wanted to use it, particularly a freight transfer siding next to a harbor. You can see that the nose is clearly shorter now, but actually the entire thing has been shrunk down. It's around the same length as my Amtrak/Metroliner engine now, and looks significantly better (less askew) going around a tight 9V track curve. On to the next challenge!